Mother Earth has come centre stage as the ultimate customer. We are inconvenienced by the business sacrifices we have to make in order to avoid Mother Earth rebelling against the planet. This has become Urgent and Important. Yet, there have been visionaries who have placed Mother Earth at centre stage, a century back. They believed the need was Not Urgent but Important. This realization was sufficient to adopt Green Practices in all their operations at the turn of the 20th century. Such has been the Godrej Family legacy. At the 29th Qimpro Awards Ceremony, Qimpro Foundation honoured The Godrej Family with the first Qimpro Green Legacy Award. 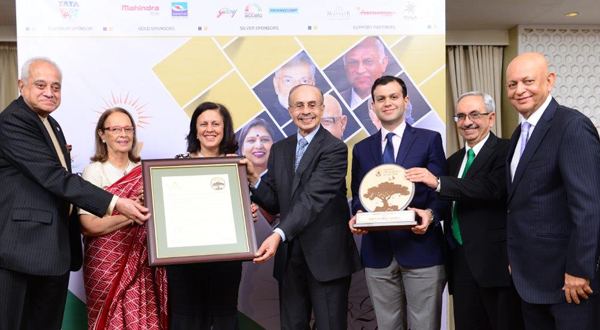 The award was presented by Hemendra Kothari and Roger Pereira to five members of the Godrej Family who attended the Ceremony: Adi Godrej, Pheroza Godrej, Nadir Godrej, Dr Rati Godrej and Burjis Godrej. I wish to share the inspiring citation that accompanied the award. The Godrej Group is an Indian conglomerate headquartered in Mumbai, managed and largely owned by the Godrej Family. It was founded by Ardeshir Godrej in 1897. His vision of self-reliance was carried forward and built upon by his brother, Pirojsha Godrej. Over these 120 years, the Group has earned the trust of millions of customers and clients, across the globe. The Godrej Group has a wide spectrum of businesses. At one end these businesses include consumer products, appliances, furniture, agricultural inputs and real estate. At the other, there are businesses like process equipment, chemicals, material handling, storage solutions, aerospace & defence. Ardeshir Godrej’s vision of self-reliance fulfilled. India made proud. The century-old differentiating philosophy of the Godrej Family has been: “To provide for today’s and tomorrow’s needs of consumers, with minimal adverse environmental impact”. They have always been conscious of the need to conserve Mother Earth and her precious, bountiful resources. The Godrej Family loves Mumbai. One of Mumbai’s largest natural reserves, the mangroves at Vikhroli, are cared for by the Godrej Family. These mangroves are virtual lungs for the city and they provide vital ecosystem services. The Godrej Family facilitates research, conservation and awareness of this unique ecosystem. A benchmark Green Practice. One-third of business revenues from Good & Green products and services. Thus, the Godrej Family has set an aggressive pace to make the Planet greener, especially for generations yet to be born. A pace that is admired globally. The Godrej Family is also one of the most respected philanthropic business families of India that believes in doing well by doing good. We salute the Godrej Family, winner of the first Qimpro Green Legacy Award 2018. Heartiest congratulations to the Godrej family who are true champions of Mother Earth. Best wishes to Team Qimpro for this wonderful initiative. Congratulations to the Godrej Family for their outstanding vision and contribution through their endeavors to environment!!! Best regards to Qimpro Team to recognize and encourage such initiative !! !